At N P Financials Pty Ltd, we have developed a Unique Mathematical Model, through our 21,000 hours of Market Research, to answer the Million $ Question: “What is the Trend Now and since how long“. We will exactly show you how to calculate this to determine the following with high Mathematical Probabilities: 1. Short-Term or Immediate Trend of any Trade-able Market, 2. Medium Term or Intermediate Trend of the Trade-able Market, 3. Long-Term or Continuing Trend of the Trade-able Market. 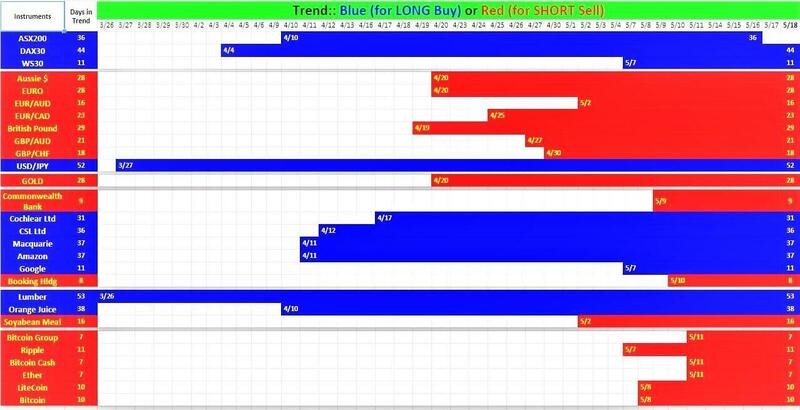 When the Short-Term Trend of any Market matches with that of Medium and Long-Term then Bingo, there is no looking back for the Market to move in that direction. We determine this Mathematically in the respective Technical Charts. The snapshot of the same for few Markets are shown here, e.g. Japanese Yen (USD/JPY) currency pair is going Long since last 52 days since 27th March 2018. Lumber is going Long since last 53 days since 26th March 2018. DAX30 stock market Index is in Up move since 4th of April for last 44 days etc. British Pound is in short-term down-trend since 19th of April for last 29 days etc. During these periods, we only consider directional Trend for the individual instrument. To find out an Answer to the Million Dollar question yourself, please contact us at 03 9566 7275 and book your FREE Trading discussion session for 30 minutes at Level 3, 2 Brandon Park Drive, Wheelers Hill, Victoria 3150. Now you can get trained by us to explore the possibility of earning passive income keeping your day job. Our Proprietary Trading Strategies will guide you through every step of your trading in Forex currency pairs, Commodities, Shares, Bond, Indices and Crypto Currencies to explore the possibility of earning extra income. Learn what all other instruments we are Trading in our 6 Trading Asset Classes. Develop yourself as a professional trader capable of capturing extra income in future with us.